The Los Angeles Rams had won four straight NFC West titles and were looking to clinch a fifth as they hosted the Oakland Raiders on December 4, 1977. Head Coach Chuck Knox, unhappy working for owner Carroll Rosenbloom but still at the helm, had molded the Rams into a consistent winner with a ground-oriented offense and solid defense, although the winning had yet to reach full fruition in the postseason. 34-year-old Joe Namath had come from the Jets and started the season at quarterback but was quickly supplanted by Pat Haden, who made up for a lack of size and arm strength with mobility and intelligence (he had studied at Oxford as a Rhodes Scholar). 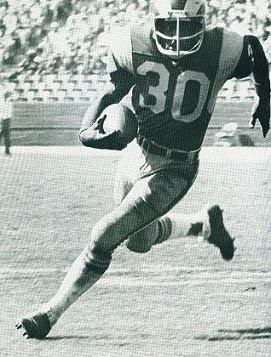 HB Lawrence McCutcheon (pictured above) ably led the ground game and, when the Rams passed, they had an outstanding deep threat in WR Harold Jackson. After getting off to a 4-3 start, Los Angeles had won four straight – with the defense giving up no more than ten points in any of those games – and came into the contest against Oakland at 8-3, a full two games in front of the nearest competitor in the division. The Raiders, coached by John Madden, were the defending NFL Champions but, at 9-2, were in a battle with the upstart Denver Broncos for leadership in the AFC West. QB Ken “The Snake” Stabler was having something of an off year, but the Raiders were still a tough, veteran club. There were 67,075 fans in attendance on a pleasant day at the Los Angeles Memorial Coliseum. The Raiders had first possession and drove just past midfield before Stabler was intercepted by LB Jim Youngblood. 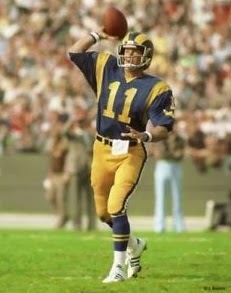 The Rams moved into Oakland territory with Lawrence McCutcheon running effectively and catching a pass from Pat Haden (pictured below) for a 14-yard gain in a third-and-six situation. The drive finally stalled at the 28 but LA came up empty when Rafael Septien’s 46-yard field goal attempt sailed wide to the right. The teams exchanged punts but the Rams got another break when WR Rick Jennings of the Raiders fumbled while attempting to make a fair catch of Glenn Walker’s kick. Rookie safety Nolan Cromwell recovered at the Oakland 27 and this time LA did not fail to capitalize. Following two short passes, McCutcheon carried five straight times to reach the three and FB John Cappelletti ran the final yard for a touchdown. Septien added the extra point. In a series that carried over into the second quarter, the Raiders responded by advancing into Los Angeles territory, but Errol Mann’s 39-yard try for a field goal was blocked by CB Pat Thomas. The teams again traded punts before Oakland once again marched into LA’s end of the field. The Raiders started off at their ten but HB Clarence Davis took a pitchout and ran 32 yards and a 12-yard carry by FB Mark van Eeghen brought the ball to the LA 37. Following two short runs and a pass, Stabler fired twice for the end zone. The first fell incomplete and the second was picked off by CB Monte Jackson to extinguish the threat. However, it was now Oakland’s turn to benefit from a turnover. Cappelletti fumbled and DE Pat Toomay recovered for the Raiders at the LA 31. Eight plays later, and with just under a minute remaining in the half, FB Pete Banaszak pounded one yard for a TD. Mann’s extra point tied the score at 7-7, which remained the tally at halftime. The Rams took the second half kickoff and rolled methodically down the field, going 62 yards in 11 plays. Haden threw to TE Terry Nelson for 16 yards and to Cappelletti for nine yards in a third-and-four situation. Another 16-yard completion to Nelson got the ball to the Oakland 11 and, after McCutcheon ran twice and Haden’s third-down pass was tipped by DE John Matuszak, Septien kicked a 21-yard field goal to put Los Angeles back in the lead. The Raiders reached the LA 45 on their next series before having to punt. The home team got a big play when Haden threw to McCutcheon for a 30-yard gain to the Oakland 36, but the drive stalled and the Rams punted in turn. A Stabler pass was tipped and intercepted by SS Dave Elmendorf, but Oakland got the ball back on the next play when Cappelletti fumbled again and CB Lester Hayes recovered. As the game headed into the final period, the Raiders reached the LA 32, but Stabler fumbled when sacked by LB Isiah Robertson and DE Jack Youngblood came up with the ball. The Rams went 17 yards in six plays before Septien kicked another field goal, this time from 44 yards, to make it a six-point game. But the Raiders, starting at their 13 following a penalty on the ensuing kickoff, responded with a 12-play, 87-yard drive. Davis and van Eeghen ran the ball well and, when the series stalled at the Oakland 45 and the Raiders punted, an offsides penalty on the Rams kept the possession alive. Van Eeghen took off for a 20-yard run and a defensive holding penalty allowed the Raiders to convert another third down. Finally, Stabler threw to TE Dave Casper for a 21-yard touchdown and, with Mann adding the extra point, Oakland was in front by 14-13 with less than five minutes remaining to play. With the ball at the LA 17 following the kickoff, Haden threw to Nelson for 20 yards and, after a short running play, tossed a swing pass to Cappelletti for another ten. McCutcheon ran for six yards and another swing pass lost ground, but Haden then went long for the fleet Harold Jackson who caught the ball in the end zone for a 43-yard TD. Septien’s PAT made it a six-point lead for the home team. There were still two minutes left as the Raiders took possession. 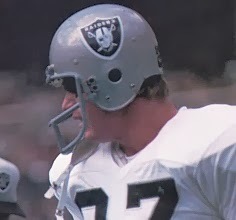 Stabler was looking to pass on every play, and after being sacked by Jack Youngblood to face a fourth-and-20 situation, he connected with Casper for a 24-yard gain. Two plays later, “The Snake” hit WR Cliff Branch for nine yards, but a sack and an incomplete pass had the Raiders back at their 49 with seven seconds remaining on the clock. Stabler found Branch for 24 yards but time expired before he could get out of bounds and the Rams came away with a 20-14 win. The Raiders led in total yards (351 to 302), with 198 of that total coming on the ground, and first downs (27 to 19). However, Oakland also turned the ball over six times, to two suffered by the Rams. Stabler was also sacked four times, as opposed to two recorded by LA. Pat Haden completed 13 of 22 passes for 186 yards and a touchdown with no interceptions. Lawrence McCutcheon ran for 97 yards on 25 carries and also led the Rams with 63 yards on four pass receptions. John Cappelletti had 5 catches for 29 yards to go along with his 34 yards and a TD on 13 rushing attempts. Terry Nelson contributed three receptions for 51 yards while Harold Jackson had the one big 43-yard scoring catch. For the Raiders, Ken Stabler was successful on 16 of 38 throws for 194 yards and a TD, and gave up four interceptions. Clarence Davis rushed for 80 yards on 10 carries and Mark van Eeghen was right behind as he gained 79 yards on 16 attempts. Dave Casper (pictured at right) topped the receivers with 5 catches for 73 yards and a touchdown and Fred Biletnikoff added four receptions for 47 yards. The win for the Rams clinched another NFL West crown and they finished at 10-4. However, they once again fell short in the postseason with a loss to Minnesota in the Divisional playoff round. The loss for the Raiders assured that they would need to qualify for the postseason as a Wild Card entry. They did just that, winning their last two contests to place second in the AFC West at 11-3. Oakland won an exciting overtime game in the Divisional round over the Colts before falling to the Broncos in a close contest for the AFC Championship. Lawrence McCutcheon ranked third in the NFL with 1238 yards on 294 rushing attempts (4.2 avg. ), his fourth thousand-yard season in five years. He caught 25 passes for 274 yards and scored a total of nine touchdowns in garnering his fifth consecutive selection to the Pro Bowl. Pat Haden ranked third in the league in passing with an 84.5 rating. He completed 56.5 percent of his passes for 1551 yards and 11 touchdowns, giving up just 6 interceptions, and was also named to the Pro Bowl.